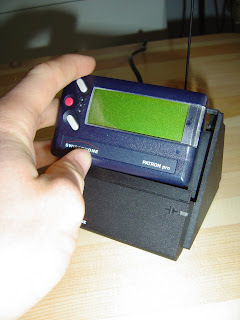 In Quon v. Arch Wireless Operating Company, 445 F.Supp.2d 1116 (Central District of California, 2006), a federal district court held that a police sergeant had a Fourth Amendment expectation of privacy in messages sent from and received on the pager his department supplied him for official uses. The case was a civil suit asserting violation of privacy, and presented many issues I won’t even attempt to go into. I want to address the issue of a public employee’s Fourth Amendment right to privacy in a pager (or other electronic communication device) provided by his or her employer. In O'Connor v. Ortega, 480 U.S. 709 (1987), the U.S. Supreme Court held that public employees can have a Fourth Amendment expectation of privacy in their desk or other work-related areas. The Court said that the issue has to be decided on a case-by-case basis, and that "[p]ublic employees' expectations of privacy . . . may be reduced by virtue of actual office practices and procedures, or be legitimate regulation." So, what often happens in cases involving police searches or other official intrusions into a public employee’s email or other communications is that the court will see if the agency the person worked for had a policy which said, say, “there is absolutely no expectation of privacy in any email you send or receive on this system.” Email systems often have a banner that has an announcement to this effect, and courts usually find that this negates any expectation by the employee that his or her email will be private. Lieutenant Duke made it clear to the staff, and to Quon . . . that he would not audit their pagers so long as they agreed to pay for any overages. Given that Lieutenant Duke was the one in charge of administering the use of the city-owned pagers, his statements carry a great deal of weight. Indeed, before the events that transpired in this case the department did not audit any employee's use of the pager for the eight months the pagers had been in use. This was true even when overages were involved. Lieutenant Duke in effect turned a blind eye to whatever purpose an employee used the pager, thereby vitiating the department's policy of any force or substance. By doing so, Lieutenant Duke effectively provided employees a reasonable basis to expect privacy in the contents of the text messages they received or sent over their pagers; the only qualifier to guaranteeing that the messages remain private was that they pay for any overages. . . .
That the pager in question was owned by the City adds nothing by itself to the analysis. A per se rule that public employees cannot have a reasonable expectation of privacy when using property owned by their employer would be at odds with the Supreme Court's holding in [O’Connor v.] Ortega. There the Supreme Court held unanimously that the employee could have a reasonable expectation of privacy in the personal items he stored in a desk that was presumably owned by his employer. . . . . Here, any lessened expectation of privacy in one's pager messages due to it belonging to the City was canceled out by what the City, through Lieutenant Duke, communicated to its officers on how they could use that equipment. Similarly, defendants' plea that the use of such equipment in the workplace is entitled to a lesser expectation of privacy given . . . `social norms’ -specifically, that `with the proliferation of’ various electronic communication systems "in the work place, it is extremely common for employers to monitor employee usage of these devices and systems"--loses its salience in light of the particular circumstances of this case. Appeals to broad societal norms quickly give way once an employer, like the defendants in this case, promulgates and announces a policy to its employees detailing how much privacy to expect in using specified equipment. At that point such general norms are trumped by the particular norm that was implemented in the work place in question. . . . The Court finds that it is unreasonable to expect that an employee would assume that some other unstated norm should inform their opinion on how much privacy to expect in using an employer's equipment once that employer expressly informs his or her employees of an actual policy regarding the use of that very equipment. Quon v. Arch Wireless Operating Company, 445 F.Supp.2d 1116 (Central District of California, 2006). Here the employee wins on the Fourth Amendment privacy issue because a senior employee basically negated the policy the police department had established. I’ve seen another case or two where something like this happened, in one instance because the public agency had (very reasonably I’d say) told employees they could use their office computers for private data and private emails. Having said that, the agency then created a Fourth Amendment expectation of privacy. My sense, though, is that agencies are usually very careful to make it clear that their employees have no expectation of privacy in agency computers, pagers, etc., and do not send conflicting messages, as in this case.